The Palm Tree is triggered by a motion sensor, which lights up the LED powered tree as soon as someone moves in front of the piece. Continuous triggering (dancing, jumping, waving..) will soon start an animation: first in brightness of the tree, then the “disco mode” will engage. When interaction stops, or someone just passed by, the tree goes back to the dimmer state. For the Destination Moon Festival for solar-based Art and Music, a solar powered turntable had been built. 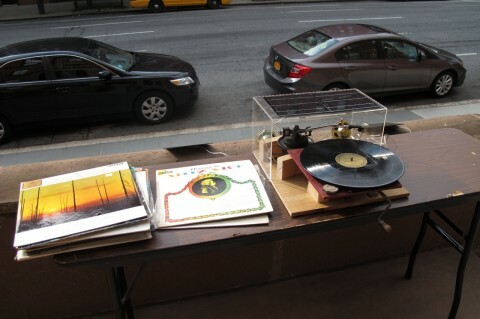 While the sun provided energy to run the machine, records were played on the street in front of the festival. This lead to interaction not only with visitors to the festival, but people from the street which were passing by the artwork. As a continuation of my project of bringing radioactive ducks to europe, i started to build radioactive flamingos for new york. They containt electronics from a solar garden light, so they charge during the day, and start glowing their eyes at night. Here in the US, the flamingos are the equivalent to the projects with plastic ducks in germany, people put them in their yard, as there are no real animals to adore. 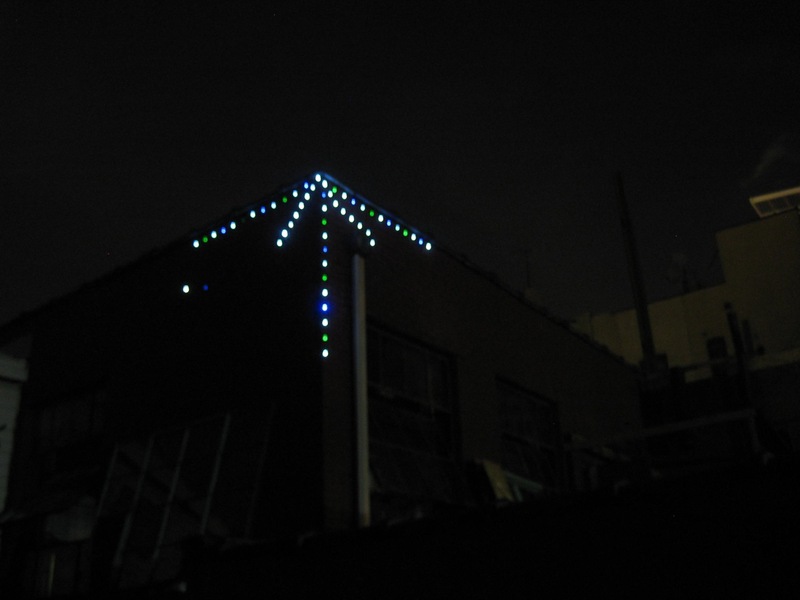 On the roof of Flux Factory, I installed a temporary light installation, called ‘Flux Star’. It is a solar powered reference to graffiti, where painting a star out of 4 or 8 simple lines was established to be put on walls trough out the city. 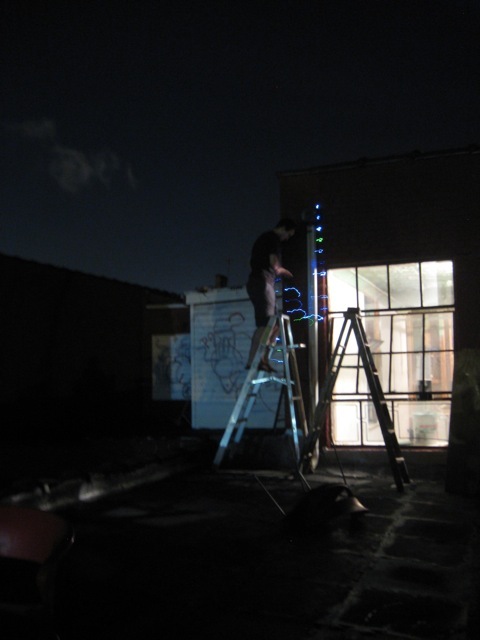 Most parts come from a solar powered string light, which I bought and took apart to harvest LEDs and the main unit featuring a solar panel, a battery and the electronic parts to drive the LEDs. 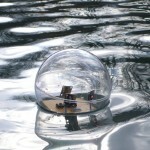 The circuit is quite similar to those used in the ducks, but more powerful. 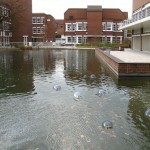 More information to come, if the installation gets re-done into a permanent artwork. 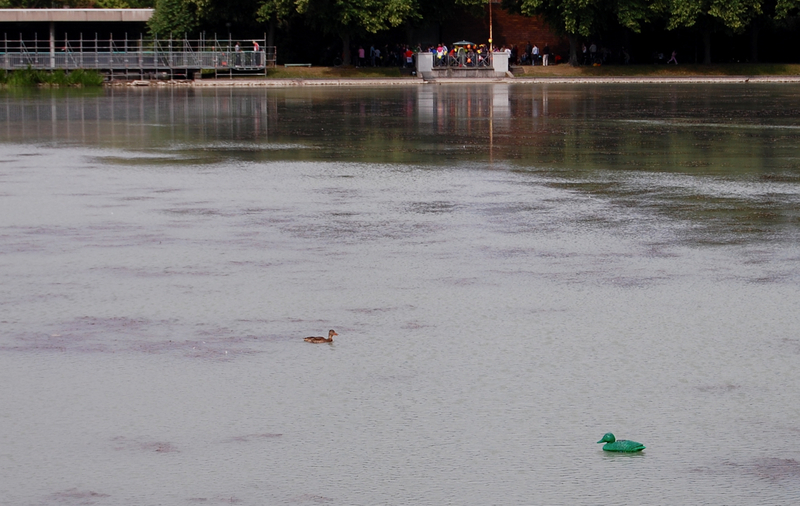 The radioactive duck can be visited at Aachener Weiher, Cologne. It is located across from japanese institute. “Protozoa Sphaerae Lucere”, my proposal for an art work in public space, came up second in a call by the french-german insurance company AXA. 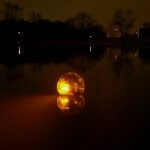 It is a LED driven light installation, consisting of thirty spheres floating on a pond. Each is equiped with environemental sensors to react to its surrounding, the whole system is solar powered by an external solar field. Many thanks to Peter Schuster and Martin Nawrath from KHM, which supported me through the planing!